Part of the China CSSC Holdings Limited group, Chengxi Shipyard has established itself as one of China’s leading shiprepair and conversion yards, with a particular focus on high value projects including those that have a significant technical content. During 2018 for example, the yard carried out work to 15 gas carriers, 57 chemical tankers and 32 open hatch general cargo ships, among others. Aside from conventional drydocking work, Chengxi Shipyard undertook a significant amount of highly specialised repairs to these vessels. This included low temperature steel and piping removal, LPG compressor maintenance, cargo and booster pump maintenance, and pressure vacuum (PV) and cargo relief valve overhauls. Much of this work was undertaken in the yard’s temperature and humidity-controlled workshops which have been set up specifically to provide a suitable clean environment for LPG and LNG vessel work. The most notable project undertaken at the yard last year, however, was the conversion of the 2,500teu container ship Hermes Arrow into an orange juice carrier – Citrus Vita Brasil – for the Brazilian firm Citrosuco. The converted vessel left Chengxi Shipyard in October after an 8 month long conversion which transformed the container ship into the world’s largest juice carrier, with 15 cargo tanks and a total transportation capacity of 30,000tons of juice. 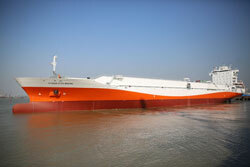 This was the first juice carrier conversion to be carried out at a Chinese shipyard. Chengxi indicates that it hopes the successful completion of this project will lead to further cooperation with Citrosuco in the future. Looking ahead, one of the most dynamic areas of its repair and conversion business in 2019 relates to a rapidly increasing number of scrubber retrofitting projects designed to allow vessel operators to comply with new sulphur fuel emissions regulations. Chengxi Shipyard currently has an orderbook of more than 80 vessels that will be docked for scrubber retrofits, including containerships, bulk carriers and tankers. Most of the scrubbers that will be installed at Chengxi Shipyard will be of the open loop type, supplied by Fern Marine, Damen and its own in-house brand, CX-CSPI. Chengxi points out that it provides a comprehensive range of services for scrubber retrofits, including 3D scanning, detailed design, class approvals and the supply and installation of the scrubber systems themselves. One of the key trends that Chengxi is responding to at the present time is the requirement for stronger environmental and safety controls in the Chinese shiprepair industry. New regulations have been implemented by the Chinese government relating to environmental protection, safety and occupational health, and this necessitates the introduction of new technology and equipment, as well as improved worker skills. For instance, Chengxi notes that it is currently promoting a technique known as wet mist grit blasting, as an alternative to sand blasting. This technique has been developed by the company since 2017 and it is in the process of applying for a patent. The yard says that the surface treatment process has been checked and accepted by several leading paint manufacturers, including International Paint, Jotun, Hempel, PPG, CMP, KCC and Hilong. The yard is now stepping up investment in the necessary equipment and it currently has 50 wet mist grit blasting units in service, giving it sufficient capacity to meet the surface treatment needs of all vessels calling at the Chengxi shipyard, with effect from February this year. Occupying an area of around 980,000m2, Chengxi Shipyard operates a total of five floating docks which can be used for repair and conversion projects. The largest of these measures 330m x 53.5m, and has a capacity of 50,000tons. The yard also has over 2,400m of quays for alongside vessel repairs.